On a bright day in Dunedin's rocky uplands where half-grown lambs, easily mistaken for withering tussock, sit in the shade of schist outcrops you may spot a critter revelling in the warmth of the rock before scuttling away into a crevice. For years, these crevices have protected the Otago skink from flying raptors such as the New Zealand falcon or Australasian harrier hawk. Now, the skinks have little chance of surviving the attacks of feral cats, ferrets, magpies, hedgehogs, stoats or even rats in their diminished home range of Macraes Flat, Nenthorn and southern Strath Taieri. As part of a recovery project for the survival of the species, 30 skinks were translocated to Orokonui Ecosanctuary in 2013. 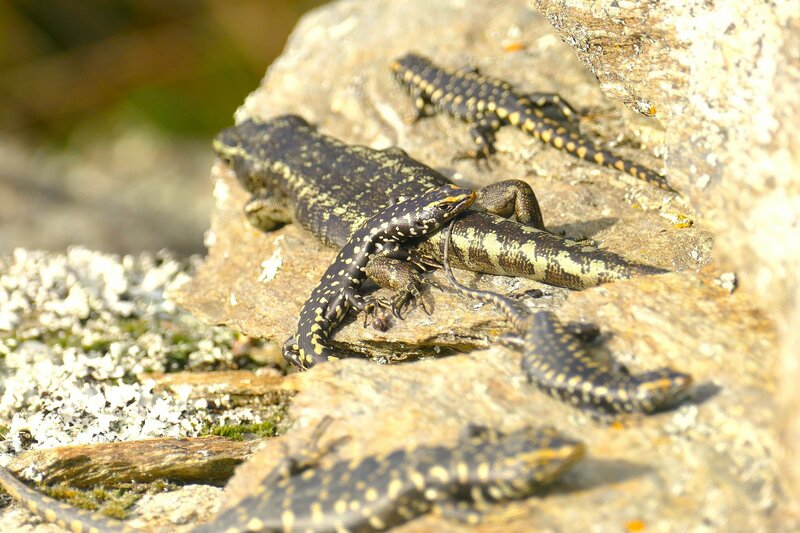 Here they live in an enclosure of artfully positioned schist rocks, mottled with lichens, on which the lizards bask on a fine day, unperturbed by the intrusion of an astonished visitor. On a cold day, they are likely to be hiding away in the crevices. This protected population of skinks can be easily accessed, which has allowed researchers such as Vanitha Elangovan an opportunity to study them, revealing some interesting findings. For her master's degree thesis, Ms Elangovan spent six months observing the skinks' social behaviour and associations. She visited them twice a day, three days a week, and consequently became very familiar with their habits and behaviour. On warm days they would congregate in clusters, flattening their bodies on the rocks, and she would recognise each individual skink by the special markings by its ear. These ID markings had been photographically recorded previously by two of her supervisors, Dr Stephanie Godfrey and Dr Joanne Monks, during a sampling session in November 2017, when each individual was allocated a number. The adult skinks were sexed and tail tissue was obtained from six subadults and two juveniles for future DNA analysis. Ms Elangovan used this photo library to identify each skink and decided to give them names of their own. Skinks flatten themselves on the rocks to maximise heat transfer. "Rani" was named after her mother, others she named after her friends. "Little Miss" got her name after she was discovered to be keeping company with the takahe outside the skink enclosure, as well as fraternising with her own kind inside the enclosure, making the most of both worlds. Unlike many other lizards, Otago skinks give birth to live young, which happens at this time of year. In captivity, they tend to have about six young, twice as many as in the wild. Ms Elangovan's study included 15 juvenile skinks, born in the Orokonui Otago skink enclosure. They were often seen basking on the rocks with the adults, proudly displaying their more vivid colorations. Ms Elangovan used DNA samples to test the genetic relatedness of the skinks that clustered together. Her data showed that family members tended to aggregate. It also showed that adult skink groups were stable over time but juveniles tended to show more variability in their social structure. She also measured the rock ledge temperature, which did not seem to affect skink aggregations. Interactions between the skinks were not always passive. After scarcely seeing a certain individual for a couple of months, one morning she observed aggressive behaviour between him and another larger skink. When she returned after lunch, she describes a scene that could easily have been out of Animal Planet: she saw the larger skink grab the smaller one by the neck and toss him around like a rag-doll, eventually dragging him into a crevice and proceeding to devour him. If you want to observe the skinks, Ms Elangovan recommends the rocks on the north side of the enclosure, as this seemed to be the skinks' preferred sunbathing spot. Sometimes it might take a few moments to focus one's eye, as the skinks' camouflage is effective. Squeals of delight are often heard as visitors suddenly spot a skink. This is generally accompanied by excited finger pointing as the skinks' glossy black shape, with golden markings, is revealed on the lichen encrusted schist. Such sightings are rare in the wild. As well as providing an opportunity for students to study them more closely and the public to enjoy their beauty, the enclosure gives the skinks a life free of introduced predators, which have, along with habitat destruction, resulted in the near extinction of New Zealand's largest and rarest skinks. And yet, even there not all danger is averted, as Ms Elangovan discovered. Although in the Orokonui sanctuary the threat of introduced pests is assiduously controlled, danger may still lurk from potentially cannibalistic neighbours. As David Attenborough said in his series Life in Cold Blood: "Reptiles are sometimes thought of as primitive, dull and dimwitted. In fact, of course, they can be lethally fast, spectacularly beautiful, surprisingly affectionate and very sophisticated." Jeanne Hutchison is a volunteer guide at Orokonui Ecosanctuary.